In this post How To Create Conditional Log Statements in Xcode I described how you could add a DEBUG flag to your Xcode project setting so that you could use statements like #ifdef DEBUG in your code. 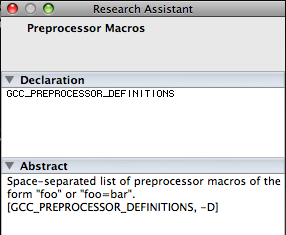 There’s already another key named “GCC_PREPROCESSOR_DEFINITIONS”. Please enter a different name. Note that I’ve only seen this change for projects that I’ve created in Xcode 3.1.3 (which by default only have a SDK 3.0 target). Projects that were created in older versions of Xcode (even if they can target SDK 3.0) still show the GCC_PREPROCESSOR_DEFINITIONS label under the heading User-Defined. I was unable to set DEBUG=1 because the “GCC 4.2 – Warnings” section disappeared when I chose the Debug configuration. Changing the base SDK from Simulator to iPhone Device fixed that and now #ifdef DEBUG works again.